Growing up, I can recall countless mornings that our family ate breakfast together before school. Because my parents traveled almost every weekend with their ministry to churches around the country, they really prioritized family time during the week. Family breakfasts and family dinners were the centers of that time. Each school morning, we would gobble up some cinnamon toast or pancakes, and before we headed out the door, we would often study a deck of brightly colored cards that each held a Scripture. The verses were short and simple, and we would memorize them one by one as a family. It probably felt a little forced at times, but the fact that I still remember so many of those verses is a testimony that it worked. The Word of God was becoming rooted in my little 8-year-old heart. Then I was 16, and had to travel to Texas to go to court concerning a serious car accident I'd been involved in. I was petrified, to say the least. My mom and I prayed so fervently surrounding that trip, and the verses that really ministered to us during that time were Psalm 37:5-6, which say, "Commit your way to the Lord. Trust him and he will do this: He will make your righteousness shine like the dawn, the justice of your cause like the noonday sun." His Word came alive to me and I needed it like I needed oxygen. I knew He cared for me deeply, and that He was speaking to me through the ancient, living words of the Bible. Then there were times in high school and college that I was truly committed to memorizing Scripture, even entire chapters at a time. James 1-2 and Philippians 2-3 stick out especially, and though it's been years since I worked on them, large pieces of those chapters come back to me at just the right time. God speaks through His Word. It's living and active. Do you believe that? Have you seen it come alive in your own life? Memorizing Scripture is not just for the head knowledge or the bragging rights. Far from it. As a believer, I crave God's Word like nothing else. I need it like nothing else. It nourishes my soul and points me to Jesus, whether I'm memorizing a passage in Ezekiel or Matthew. 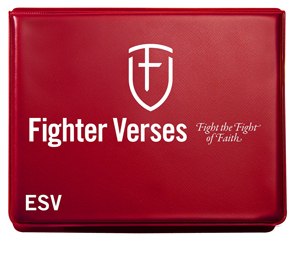 I was thrilled to recently discover an iPhone app called Fighter Verses that aids in Scripture memory. 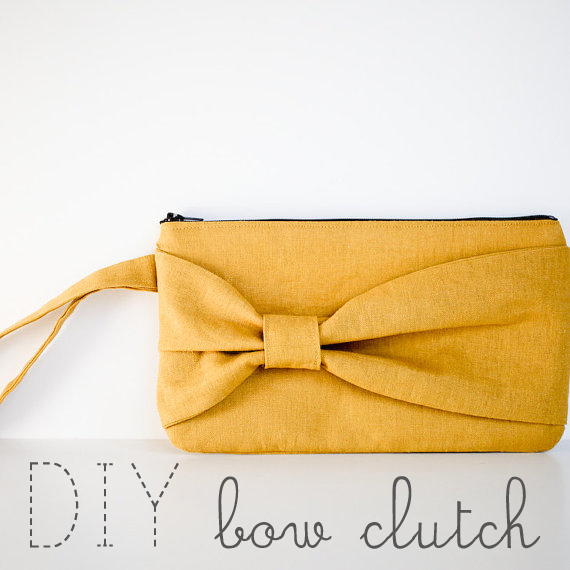 (And it's not only for iPhones... there are many resources if you go to the site.) 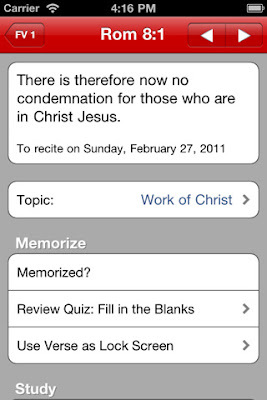 There are hundreds of verses in the ESV version to memorize, and the app helps you along with quizzes, memory songs, links to commentaries on that specific verse, and even an easy way to store the verse on the lock screen of your iPhone. I am memorizing Psalm 103 this week, and it has been so smooth with the help of this app because every time I turn on my phone, I see the verses I'm working on (and I turn on my phone a lot... I'm sure I'm not alone). There's even a kids' version that uses pictures to prompt their memory of specific verses. Anyway, I just couldn't help but share. I'm thrilled to be actively memorizing Scripture again after a much-too-long hiatus as I know it's the most powerful thing to change my heart, to sharpen my mind, and to make me the best wife, mother, friend, daughter, sister, and lover of Jesus I can possibly be. Thank you for sharing this! I'm excited to use it!!! Couldn't agree with you more!!! The Fighter Verse App is on my phone as well, and although it's not my preferred method of working on scripture memory, it's super helpful in just finding short passages on specific subjects (see the Topics section!) The app is a branch of John Piper's Desiring God Ministry and I would totally encourage you to find his sermon from Passion Ft Worth 2011 to the "Adult leader community group" on scripture memory. It's fantastic! I try so often to emphasize the importance of scripture memory to our students, which isn't the easiest thing to sell to high school students. I'm with you...i crave God's word. thanks for sharing. have you heard of seeds family worship? it's music for chlldren and it's just verses. my husband and i like listening to it with our kids. check it out. i bet you'll love it once your little one arrives. Hubby is looking the app up for me now! Thanks for the suggestion!! It's reasons like this that I hope you keep blogging for a long time. 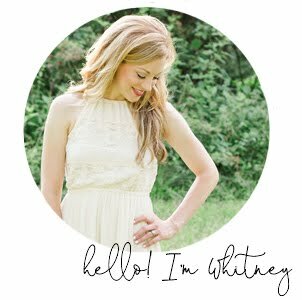 You're so encouraging to my (and I'm sure so many others') walks with Christ, and it seems like it just exudes from who you are. Thank you for never backing away from that! I'm going to download the app right now! Thanks! It's true - the Word is living and active. Just this week, I truly needed the words from the beginning verses of Romans 5: "...hope does not disappoint us, because God has poured out his love into our hearts through the Holy Spirit, whom he has given us." Comfort at just the right time - He's alive! I've really been feeling a pull to memorize more scripture lately...I used to have to memorize verses for church & for working with Child Evangelism Fellowship (which I did from the ages of 12-19), but now it's harder for me to stay motivated. I will definitely check out that app. Thanks for sharing! Thank you so much for sharing! I've been wanting something like this, a tool to help me be more faithful with getting scripture deep in me. I can't wait to check it out! The Lord has used these so powerfully in my life over the years. Hope the last two months of pregnancy go great! Then approve whatever and also wait on sometime. xhubs installation download xhubs also comply with directions very carefully to finish the installment.